Jason "Jayce" Lightwheel is chosen to go on an intergalactical quest to rejoin his father and save the universe from the wrath of Saw Boss & his Monster Minds Family Empire. 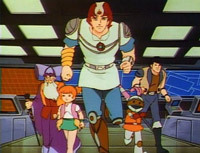 Together with his Lighting League, consisting of Oon, Flora, Gillian and Herc, Jayce fights against the evil forces of Saw Boss and his Monster Minds. The Monster Minds can transform into monstrous vehicles, which Jayce battles with his own weaponized vehicles. The Lighting League, lead by Jayce, fights against the evil forces of the Monster Minds. Jayce's goal is to reunite with his father and to put the two pieces of the Root together to extinguish the Monster Minds once and for all. The Lighting League consists of Jayce, Gillian, Flora, Herc and Oon. Leader of the Lighting League, son of Audric Lightwheel. In search of his father, Jayce travels across the universe to fight the evil Monster Minds together with his Lightning League. Weapons: Ring Of Light and half of the Magic Root. Voiced by: Darrin Baker. Born May 7, 1965. Image via IMDb. Audric's father, Wizardly mentor, & grandpa to both Jayce & Flora, co-creator of Flora and creator the early Lightning League vehicles. Gillian is a wizard, though he's also an engineer who created the Lightning League vehicles. Powers: Gillian posseses magical powers. Jayce's little sister was created from a flower. Powers: Has telepathic powers, can sense Monster Minds and can communicate empathically with animals, insects, machines, people, & plants. Voiced by: Valerie Politis. Image via QPicture. Oon is Jayce's trusty sidekick in the form of a robot, modeled after a knight from the Middle Ages. Even though Oon looks like a knight, he's a scary cat. But regardless of his cowardly behaviour, he always stands by his master in times of need. Voiced by: Luba Goy. Born 8 November 1945. Image via The Canadian Encyclopedia. Herc Stormsailor is a pirate for hire who joins Jayce's cause in his fight against the Monster Minds hoping to earn some money once the battle is over. Herc is the owner and captain of the airship The Pride of the Skies. Voiced by: Len Carlson. Born 1937 September 2, died 2006 January 26. Image via Behind the Voice Actors. Audric is Jayce's father, a peace loving botanist who accidentally created the Monster Minds. Weapon: Audric possesses half of the Magic Root. Voiced by: Dan Hennessey. Image via Behind the Voice Actors. Brock is Flora's pet, a flying fish, which Flora often uses as a means of travel. the Monster Minds are created by Audric Lightwheel in an accident. A burst of radiation generated by a sudden solar flare mutated Audric's plant into an evil, sentient being, and changed other plants around Audric's laboratory into similar creatures, who collectively became known as The Monster Minds. The Monster Minds can be destroyed by the Magic Root. Jayce posseses half of it and Audric the other half. Once the halves are combined, the Monster Minds will be destroyed. Lead by Saw Boss, the Monster Minds are keen on destroying the Root in order to conquer the universe. Saw Boss is the 'first born' of the evil plants and the leader of the Monster Minds. Saw can transform into a Saw Trooper. The base of the Monster Minds can teleport to any location in the universe as commanded by Saw Boss. Sub-boss of The Monster Minds, he oversees the Terror Trooper clones. Voiced by: John Stocker. Born 1947 August 13. Image via Muppetwiki. Sub-boss of The Monster Minds. to save the universe from the Monster Minds! and lead his Lightning League to victory over the changing form of Sawboss! Wheeled Warriors explode into battle! Just keep 'em turning, don't stop 'em rolling, the fire is on! Come take a chance, keep 'em turning, don't stop 'em rolling, the fire is on!